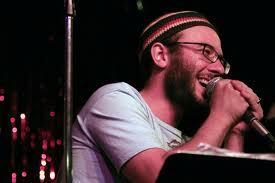 Jake Marmer is the author of Jazz Talmud (Sheep Meadow Press) and has recently released a Jazz and Spoken-Word Poetry CD entitled Hermeneutic Stomp. Marmer maintains a blog entitled Jake Marmer’s Bob Apocalypse: Poetry, Philosophy, Existential Rants. For more on his work, take a look at the blog entries Schlemiel Theory has posted blog on his recent poetry-CD. Proklos, son of Plosphos asked Rabban Gamliel a question in Akko, where he was washing in Aphrodite’s bathhouse. He said to [Rabban Gamliel], “Isn’t it written in your Torah (Deut. 13:18), ‘do not allow any banned items [from idol worshippers] to stick to your hand’? How then do you bathe in Aphrodite’s bathhouse?” He replied, “One does not respond [to religious questions] in the bath.” Once he exited, [Rabban Gamliel] said to him, “I did not enter her domain, but she entered mine. [Further], people don’t say, ‘let’s make a bath as a decoration for Aphrodite.’ Rather, they say, ‘let’s make a statue of Aphrodite as a decoration for our bath.’” Another reason: Even if someone paid you lots of money, you wouldn’t commence your idol worship if you were naked or sticky*, nor would you urinate before [your sacred object]. But this [statue of Aphrodite] stands over the sewer and everyone urinates before it. The verse “these are your gods” (Exod. 32:4) is not said about this case. If a [statue] is treated as a god, then it is forbidden, but if it is not treated as a god, then it is permitted [to be in its presence]. How does this Mishnah relate to the title of Marmer’s poem and the poem itself which addresses a dream-like revision of the Mishnah? Before we address Marmer’s poem, I’d like to preface my reading with a brief summary of the “Rabbinical” approach to dreams and follow it up with a sketch of Freud’s reading of the dream. This will help us to understand what is at stake in Marmer’s re-imagining of this Mishnaic scene. Poets have, for centuries, been interested in dreams. And dreams, to be sure, have their root in prophesy and religion. “Pagan” religion and monotheism pay much heed to dreams. As far as Judaism goes, there is an ambivalent attitude toward dreams. Many of the first prophets in the Jewish tradition communicated with God by way of the dream. But, according to Moses Maimonides, these prophets are lesser than Moses who communicated with God (so to speak) “face to face.” Maimonides, in the vein of Ancient Greek and rationalist Islamic philosophy, makes it quite clear in his Guide to the Perplexed that imagination is a deficient mode vis-à-vis the intellect. And in his view, Moses is the “greatest of all prophets” because, unlike the other prophets who communicated with God via the imagination, his intellect was perfected and his imagination was purified. And, as Leo Strauss points out in his reading of Maimonides, the imagination, for Moses, had only one purpose at that point and that purpose is political; namely, to communicate to the masses. Since the majority of people relate better to the imagination than to the intellect, it is the best medium to use for political purposes; however, it is not the highest man can achieve. Although Baruch Spinoza disagreed with Maimonides on many different points, he agreed with him on the clear distinction between intellect and the imagination. And Spinoza even found Moses at fault for, in his view, a minimal appeal to the imagination. Nonetheless, as Sarah Stroumsa points out in her book on Maimonides, Maimoindes didn’t always have a rationalist position on the imagination and dreams. As she argues, when he was younger he wanted to write a book interpreting images and the imagination which had more resonances with Kabbalah than with the Rationalists. However, his position changed over time. Maimonides understood the importance of imagery, the imagination, and dreams in Judaism. But, as we can see from The Guide to the Perplexed, he ultimately settled with the rationalist reading of dreams and imagery. This psalm gives weight to the dreams of exile. And no amount of rationalism can (or even should) be appealed to so as to eliminate these dreams. To be sure, the poet understands that dreams are or can be related to perception and desire. The question, for the Jewish poet and the Rabbi who are concerned with dreams, is how do we interpret the dreams of exile. Rav Kook reads this Psalm in terms of the “dreams of redemption” which, one day, will disappear. In his view, this did happen in some way with the founding of the State of Israel. However, the exile lives on since the “full redemption” has not arrived. For an American Jew who lives after the founding of the Jewish State, however, the dream seems to live on. And, as Jake Marmer’s poem on the Mishnah implies, imagining Rabbi Gamliel’s “Bathhouse Dreams” is of great interest to the poet. The imagination, for the Jewish poet, must be active; it doesn’t simply foster desire for redemption; it also sharpens our vision of the present and relation to the past. And, in Marmer’s poem, it does so in a comic manner. This makes it even more appealing to us, today, since one of the most important ways American-Jews have to relate to their Jewishness is by way of humor (as a recent Pew Poll shows). I’d like to briefly turn to Freud’s theory of the dream to show how this appeal to the dream works on many levels. If anyone takes the time to understand Freud’s theory of dreams, one will notice that something happens between The Interpretation of Dreams and Beyond the Pleasure Principle. In the Interpretation of Dreams, Freud looks at dreams through the lens of the “pleasure principle.” According to this theory, the psyche will go to great lengths to discharge all energy by any means necessary because the buildup of energy within the psyche is “painful.” And the pleasure principle is, more or less, the principle to maximize pleasure and minimize pain. For this reason, Freud, working on his system of the id, ego, and superego, argues that consciousness censors things that are, according to the superego, detrimental to the health of consciousness. One such thing would be sexual taboos. These, Freud argued, must be discharged. And since the conscious mind won’t let it come to the surface, taboos are buried in the unconscious only to be resurrected and discharged in dreams. But since there is also a “censor” in dreams, these feelings must be hidden in some way. For instance, instead of seeing your sister in your dream (who you may have an incestual desire for) you see a “substitute” who doesn’t look like your sister but feels like her. This theory of dreams is based on an economy of discharging energy so as to maintain the pleasure principle: in the most Greek sense, happiness/pleasure is the goal. This theory of dreams changes later on in Freud’s Beyond the Pleasure Principle. Before he wrote this book, he witnessed the dreams of men who were terrorized by experiences they had on the battlefield during WWI. Their traumatic dreams would repeat over and over again (he calls this a “repetition compulsion”). And the unconscious seemed to be deriving pleasure from this pain. And this, for Freud, was troubling; it violated the “pleasure principle.” His theory didn’t make room for trauma and, as he understood, it had to now; in the wake of his discoveries on the battle field medical tent. I’d like to posit that Freud’s theory of the pleasure principle has Greek resonances while his later approach to dreams has more of a Jewish resonance. In the latter theory, the pain of history, the trauma of history, is incorporated into the dream. It is noted and happiness is not the goal so much as memory. What I love about Jake Marmer’s poem “Bathhouse of Dreams” is the fact that it draws on Freud’s latter theory, reread the above mentioned Mishnah from Avodah Zarah, and adds a comic dimension to memory that Freud didn’t bring out in his post-pleasure principle theory. Rabbi, why are you here to wash? The music then returns to the dragnet style melody . I find this modulation and the last words to be telling. What we find in these movements and words is an awareness of the “double consciousness” of the Jew which is communicated by way of the imaginary personification of the words Gamliel never said. These words end with a pledge to become a “perpetual dreamboy” (in other words, a poet-schleimel; a “lord of dreams”) in response to the question (read as an insult) made by the Hellenist. The response punctuates a series of angry retorts that struggle to the poets mouth (this is conveyed by the music). But in the end, the position is one of withdrawal, a pledge that is, ultimately, to be found in a “locked suitcase.” This sounds like a pandora box of sorts. But if it were opened up, what we would have is not war or violence so much as rage, comedy, and dreams. This closing irony, which is the end of a build up of rage, is Jake Marmer’s way of relating to the past vis-à-vis the Mishnah and the present vis-à-vis his retelling and revising it. The accent on the present brings out the power of the dream to mark the traumatic affect of double consciousness while, at the same time, showing how humor can be used to modulate this consciousness and rage. Marmer is teaching us how, for American-Jews today, comedy and rage can go hand in hand with memory and poetic speech(that is, if one is willing to own up to one’s past struggles with society rather than forget about it). Indeed, comedy and rage can be employed in our relating to the Jewish past and the Jewish present (that is, if the relation of Jewish to non-Jewish identity is to remain an issue; if “double consciousness” is to remain an issue as it is for this poet who personifies Rabbi Gamliel). At the end of the poem, I can feel the power of the dream is not to affect a kind of happiness, as Freud would say in his early work: that the day-dream or dream accomplish happiness in spite of things that cause the psyche pain. Rather, the power of the dream-poem is to effect a sense of how something has not been worked through; comedy doesn’t eliminate rage or double consciousness. Rather, comedy shows our weakness and our strength. This is not a dream realized, as Kook would call for. And this dream is not something that can be rationalized away. Rather, this poet’s dream imaginatively taps into the past from the angle of the present so as to disclose the difficult place of “double consciousness” that Jews speak from in our post-modern age. Like Marmer, I understand his position very well. It is the position of the schlemiel. And, for the poet and audience, it is double. It is the angle of the Jewish Sancho Panza (the poet and audience) who pays close attention to the dreaming Don Quixote (Rabbi Gamliel and the poet), but with a twist: namely, the twist of historical fate which has and continues to make the Jew aware of his/her double consciousness. The schlemiel, after all, is the lord of dreams. And we, the readers of the schlemiel, are not. Yet, when we see or hear the schlemiel, we can’t help but realize that his consciousness is ours. We are in and out of reality and history. We are double. This is a bitter-sweet comedy of Jewishness. But it remains and will remain as long as the dream of exile remains a reality. When it comes to art and poetry, I am very demanding. And the reason for this has to do with who I am, where I come from, and what I dream about. But, ultimately, I’m not so unique. I feel as if there are many Jewish people out there who, like me, are yearning for a poetry that merges music, performance, and comedy with something that speaks to being Jewish, being American, and being close to something indescribable that seems to be coming at us from different directions. On my search for this kind of poetry, I have come across the work of few poets who, at one time in my life, spoke to my being Jewish, being American, and so forth. These poets – my poetic Rabbis, so to speak – are Allen Ginsburg, Charles Bernstein, and Jerome Rothenberg. What I like about all of them is the fact that they all, in some way, bring their Jewishness to bear on a poetry that is performative, musical, and, at times, comical. But, as I said, their work appealed to me at one time. Today, I need something different and this is only because I have changed and so have the times we live in. Unlike the past, I feel now, more than ever, that I – and others of my generation who wish to make Jewishness more relevant and exciting – need to find a new way to animate the Jewish text. I believe that it can be animated by a new Jewish poetics and culture which can live in the present, draw on the past, and, using the best means it has at its disposal, open itself to a new future. By opening the text (as the Zohar says in a different context), the new Jewish poet can lead the way into an exciting new form of Jewish life that is comic, poetic, musical, and performative. And we can, so to speak, dance to this new Jewish tune. On this (musical) note, I think I have found a new Jewish poet who I can listen to and join with in the project of creating a new Jewish culture. His performance-poetry speaks to my comic Jewish –American sensibility in the most innovative and inspiring ways. His name is Jake Marmer. His first work of poetry is entitled Jazz Talmud. It was published in 2011 by Sheepmeadow Press. And, most recently, he has put together a CD entitled Hermeneutic Stomp which takes the poems from his book and brings them to life by way of Jazz. His CD will be released in New York City on October 14th . For now, I’d like to go through one of these poems so as to point out how he, drawing on the tradition of the poets I have mentioned above (and a Jewish tradition called the Talmud), animates the text in a comic manner. Fortunately, we have a video from Youtube that shows Marmer at work with his Jazz group. Seeing this, after I have discussed the poem, can help to give you (my dear reader) an idea of how the performance of his poetry adds another dimension to his work. make a bad pun, for that is the meaning of peace. While the opening and middle sections of the poem are fairly set, the storytelling segment has room to let loose. As I recite it, I’m looking for openings, ideas, associated images, and commentary that I did not think of when I was working on the original draft. In this particular piece, I’m also playing with the historical talmudic form, which combined memorization/repetition (“mishnah”)with discourse/discussion/riffing/tangents (“gemarah”). This dichotomy between the two Rabbis – and the whole focus on loneliness – is challenged by Rava who says he has never known loneliness. And the punch line is that he has not known it because he has always been “surrounded by nudnicks” (a nudnick is an irritating person – a person who nags) at Yeshiva. At this point, the humor really kicks in since Rava prays to God to be left alone. He can’t take the nudnicks. This is telling and, ultimately, sounds a comic note. Here is a video of this poem when it is performed. What I love about the CD is the fact that what you hear on it is different from what you see and hear in this video. What makes this so appealing to me is the fact that the structure of the piece gives him another opportunity to say it and find new ways of accenting this comic-Talmudic narrative. More importantly, this poem (and its performance) speaks to me because it outlines what’s Jewish about his poetry: it looks to challenge the loneliness that goes hand-in-hand with so much poetry. It reminds me of the contrast between the style James Joyce uses to describe Leopold Bloom (the Jew) and Stephen Dedalus (the Gentile). The former style is more animated and comic. And, as any reader of Ulysses knows, Bloom never seems to be lonely since he’s always relating to something. He seems to be in a constant conversation with memories, people, things around him, and even animals. When Marmer recites poetry and his band responds to each of his words with this or that note or sequence of notes, the “Mishnah of Loneliness” becomes the Mishnah of peace. It tells the tale of how we, as Jews, can speak to each other. And the fellowship that comes out of this comic-musical-poetic conversation is not what Susan Sontag calls the “fellowship of suffering” so much as a “fellowship of comedy, music, and words.” This poem is a part of a renewed oral tradition which, as I have pointed out, is comic in nature. And this tradition, I aver, is the other side of the “fellowship of suffering.” Rather than surrender to sadness, Jews know how to balance it out (and not laugh it away) with a sense of humor. This shines through in Marmer’s poetry. This poem and all of Marmer’s poems speak to me – especially when they are accompanied by the music of musicians who respond. They speak to me in a Talmudic sense and in a Jewish sense. I love that the music responds to each of Marmer’s notes. That, for me, is what animation is all about. Moreover, such response is also the basis for peace since peace, as any poet knows, is based on some form of conversation. As an American and as a Jew, as a person who lives in the present but is related to an ancient past and an uncertain future, I think these parts of myself, which I share with my fellow American Jews, need to engage in more dialogue. And I think Marmer has found a great way of starting this conversation. Although Marmer is aware that we have had a Talmud for centuries which has shown us how to live our lives, he knows that today what we need more than ever is a Jazz Talmud. That is a step in the right direction. A Jazz Talmud can start a new conversation, one that speaks to me and to many of my generation who want to reconcile the differing opinions about what’s Jewish, what’s American, and how the two can converse with each other. Check out Marmer’s work on his blog: Jake Marmer’s Bop Apocalypse: Poetry, Philosophy, Existential Rants. Also check out his new CD and, if you’d like, join him at the CD release party on October 14th at the Cornelia Street Café at 8:30pm.